My favourite thing to do at the weekend is cook a special breakfast. During the week I tend to throw some fruit, granola and yogurt together and eat it at my desk. Sometimes I have a slice of buttery toast – sometimes it’s gingerbread porridge. It pretty much always takes a maximum of two minutes to put together, so by the time the weekend has arrived I’m looking forward to having the luxury of some extra time in the kitchen to make us a really nice meal. 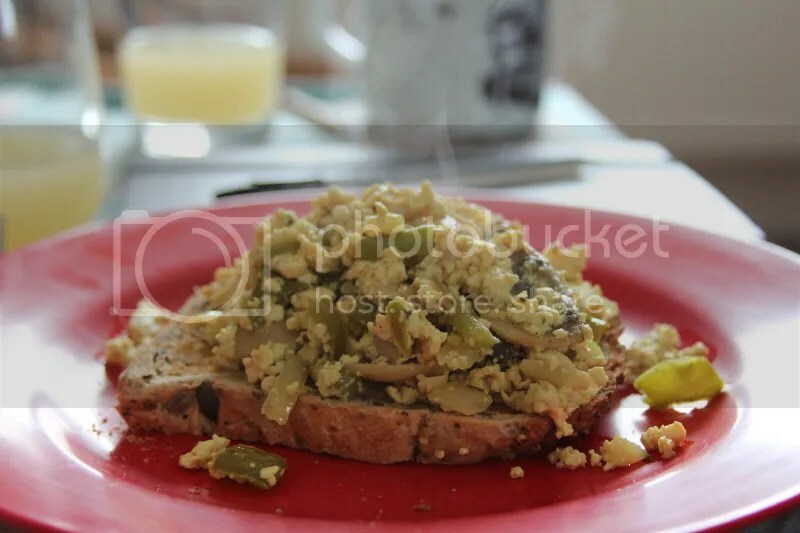 Scrambled tofu is one of my favourite brekka’s – but I never remember to make it! This is a really simple recipe, and a great way to start the day. 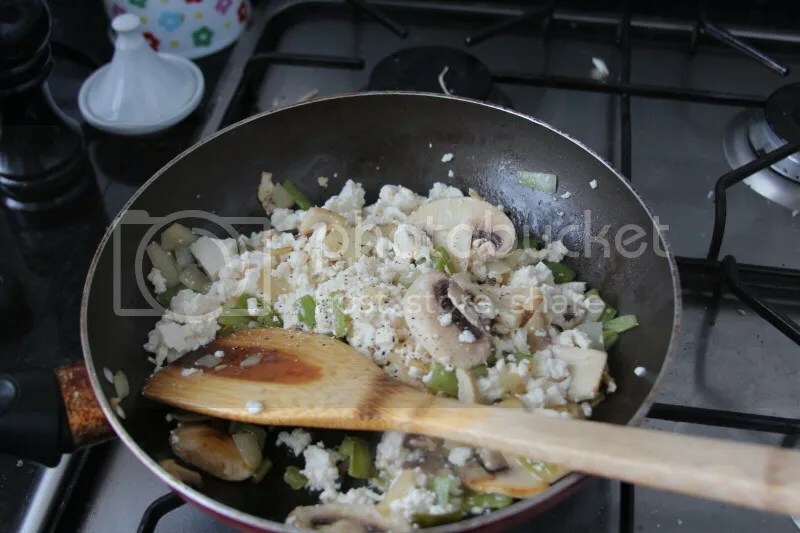 Dice half an onion and half a green pepper, slice 2-3 large mushrooms and mash up half a block of tofu with a fork. 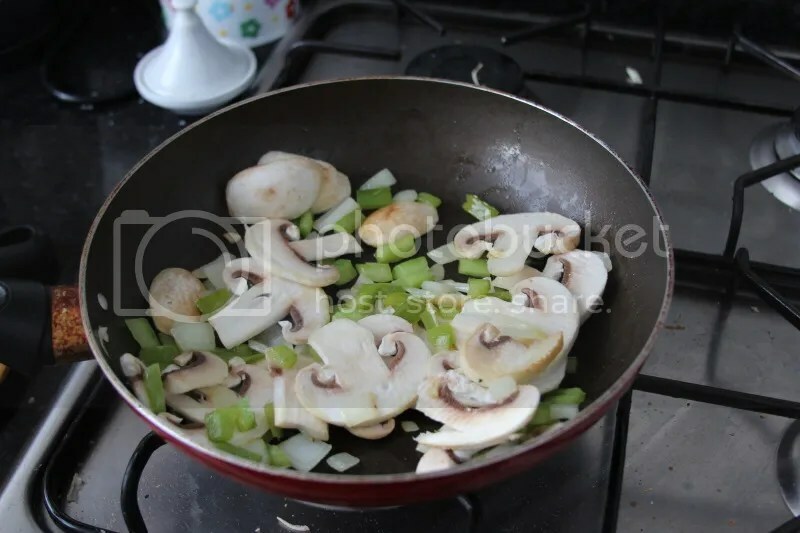 Fry up the vegetables slowly in oil, adding a knob of butter near the end. 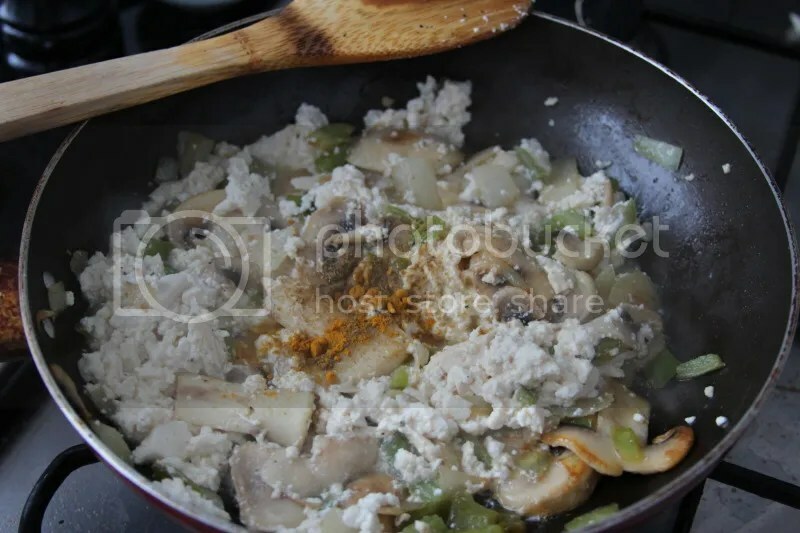 Add the crumbled tofu, and season well. Add some ground cumin and around half a teaspoon of turmeric to turn your scramble yellow! Mix everything up really well, and cook on a medium heat for around ten minutes. 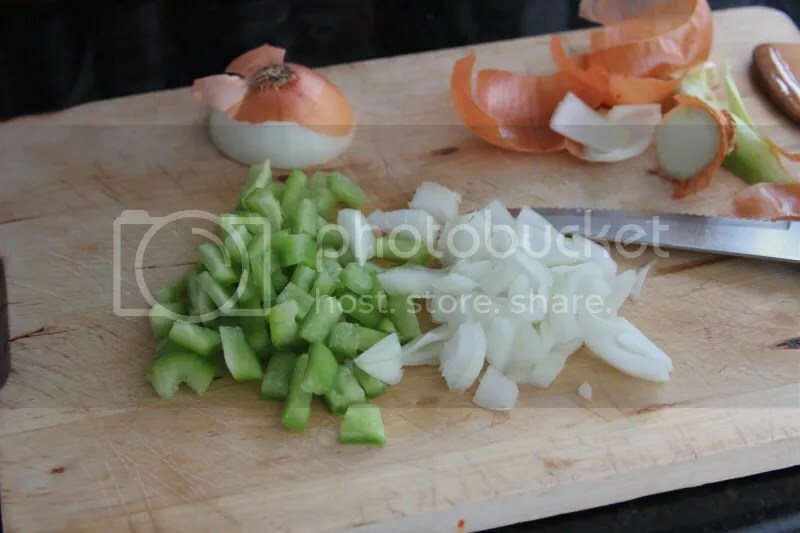 You should keep cooking until the mixture is quite dry and nicely browned. Check the seasoning, and pop your bread in the toaster. 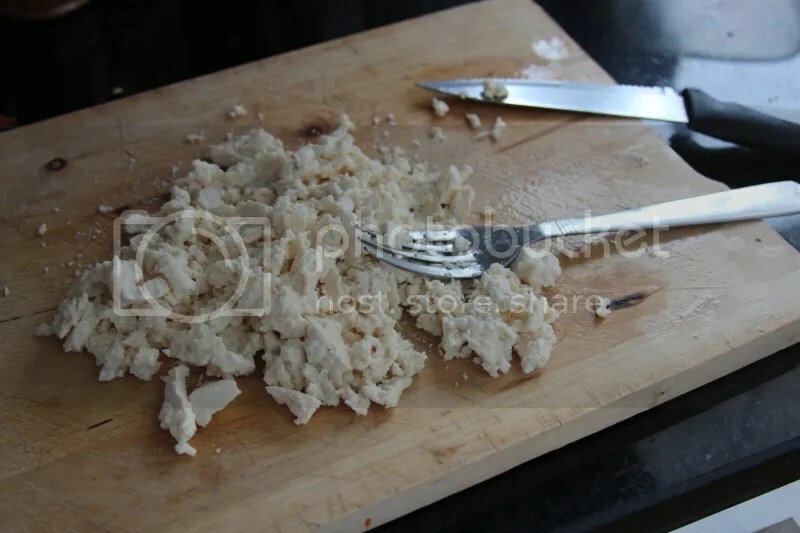 Once the toast is cooked, rub each slice with garlic and spread it with butter, before piling the scrambled tofu on top. Trout added plenty of chipotle Tabasco sauce on his, and we washed it all down with pineapple, guava and lime juice, and coffee. Have you made scrambled tofu before? What do you like having for breakfast? Adding black salt and nutritional yeast to scrambled tofu just makes it perfect. I do also always add a heaping of nutritional yeast. But yours looks amazing anyways. Ooh yes, a Mexican theme would be great. Wrapped in a tortilla! It’s been so long since I made scrambled tofu, totally craving it now!